A submarine vent SE of Iliwerung, named Hobal, erupted in December 1973-August 1974, August 1983 (SEAN 08:08), September 1993 (BGVN 28:06), and May-September 1999. No further activity was reported from this volcano until August 2013 when Hobal had another short eruption on the 20th. The Center of Volcanology and Geological Hazard Mitigation (CVGHM) reported that observers at the observation post 6 km from Iliwerung saw diffuse fumarolic emissions from the crater during the mornings from 1 to 19 August 2013. The various seismic signals fluctuated during the month, but 81 shallow volcanic earthquakes were detected between 1606 and 1741 on 19 August. The Alert Level was raised to 2 (on a scale of 0-4). At 0714 on 20 August 2013 an eruption from the submarine Hobal vent ejected dense white plumes to 2 km altitude that drifted S. Incandescence at sea level was observed at 0746, and the water around the eruption site turned yellow. Fishermen and tourists were not permitted within a 2-km-radius of the activity. Although seismicity had decreased on 19 August, the observers reported that the diffuse morning fumarolic crater emissions had continued through 1 September. On 2 September the Alert Level was lowered to 1 (on a scale of 0-4). Information Contacts: Indonesian Center of Volcanology and Geological Hazard Mitigation, Pusat Vulkanologi dan Mitigasi Bencana Geologi (PVMBG, also known as CVGHM), Jalan Diponegoro 57, Bandung 40122, Indonesia (URL: http://www.vsi.esdm.go.id/). CVGHM reported that observers at a post 590 m a.s.l. and 6 km away from Iliwerung reported that diffuse fumarolic emissions from the crater were visible during the mornings from 1 to 19 August. Seismicity fluctuated during the month, but 81 shallow volcanic earthquakes were detected between 1606 and 1741 on 19 August, compared to a total of 30 the previous 18 days. The Alert Level was raised to 2 (on a scale of 0-4). At 0714 on 20 August an eruption from the submarine SE flank vent, Hobal, ejected dense white plumes 2 km a.s.l. that drifted S. Incandescence at sea level was observed at 0746, and the water around the eruption site turned yellow. Fishermen and tourists were not permitted within a 2-km-radius of Hobal. An increase in tectonic earthquakes around Iliwerung during 17-26 October led VSI to raise the Alert Level from 1 to 2 (on a scale of 1-4). From 2 to 11 earthquakes were felt per day with Modified Mercalli intensities of I-II. Visual and instrumental monitoring did not show a significant change in volcanic activity. Explosions occurred 17 and 18 August from a submarine vent (Hobal) S of Iliwerung. No casualties were reported. Its previous eruption began with submarine activity in December 1973; by July 1974, there were two small islands at the eruption site and a third emerged in August. All have subsequently been eroded away. In July 1979, about 50 x 106 m3 of Iliwerung were removed by a landslide. About 1/3 of this material entered the sea, and (probably aided by additional submarine slumping) generated tsunami that killed hundreds of people. Information Contacts: L. Pardyanto, VSI; AFP. A submarine eruption in the Alor Strait was reported on 16 September by a Japanese cargo ship. Crew members felt three shocks at around 0630, and observed a rising steam cloud or plume soon after. Explosions occurred at 0656 and 0855. Each explosion produced a water column ~100 m high, followed by a cone of upwelling water; no other unusual phenomena were observed after the explosions. From ~6.5 km away, the ship located the explosion site at about 8.538°S, 123.592°E, SW of Iliwerung volcano. The VSI confirmed that an eruption had occurred from the submarine Hobal vent at Iliwerung. . . .
Information Contacts: JMA; M.A. Purvawinata, VSI. In September, Hobal vent on the SE submarine flanks of Iliwerung volcano (figure 1) produced an eruption that broke the ocean surface (18:08). . . . During the eruption pyroclastic material sank within ~200 m of the point where it penetrated the ocean surface, consequently no samples were obtained. This suggests that the erupted material lacked sufficient closed vesicles to allow it to float. Figure 1. Map showing Iliwerung volcano, Hobal vent, and the known extent of the 1979 landslide that triggered a tsunami. Note that N is to the upper right. Courtesy of VSI. Depth to the Hobal vent has never been measured, though in 1979 the VSI estimated it at 50 m. The bathymetry of this region is also significant because of its relevance to tsunamis. A 1979 landslide NW of Iliwerung reached the sea (figure 1), and probably aided by additional submarine slumping, triggered a tsunami that killed hundreds of people. Several areas evacuated prior to the 1979 landslide and tsunami still remain evacuated. Relevant aspects of the tectonic setting, and the effects of a 1992 earthquake-triggered tsunami on the N side of Flores Island are discussed by Yeh and others (1993). Seismic data were acquired by VSI prior to the September Hobal eruption. The data were received at Lamaheku seismic station, at ~75 -m elevation on the W flank of Iliwerung, 4.5 km from the Hobal vent. The seismic record is incomplete, but for July to September 1992, the number of volcanic B-type earthquakes averaged >70/month, reaching ~96 in September 1992. A gap in the record occurred in early 1993, but later in the year, B-type earthquakes progressively increased from ~30 in May to 60 in September. Thus, the B-type events increased prior to the September eruption, but at least one interval with more B-type events passed without reports of concurrent eruptions. VSI has informed local governments about the hazards of future eruptions, and has established a volcanic danger area that includes at least four communities on Iliwerung. Local VSI staff continue to monitor the region, and as of 1 November, were in the process of installing a new seismic station. Reference. Yeh, H., Imamura, F., Synolakis, C., Yoshinobu T., Liu, P., and Shi, S., 1993, The Flores Island tsunamis: Eos, Transactions of the American Geophysical Union, v. 74, no. 33. 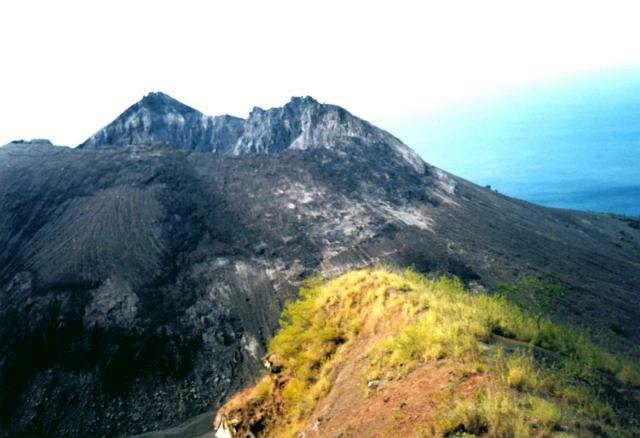 During 17-26 October 2001 the Volcanological Survey of Indonesia reported an increase in felt earthquakes. A total of 2-11 events occurred per day, with Mercalli magnitudes of I-II. The earthquakes S and P wave arrival times differed by between 1 and 35 seconds. Visual and instrumental monitoring revealed a lack of significant changes. The Alert Level was increased from 1 to 2 (on a scale of 1-4). No further reports were issued through at least May 2003. Constructed on the southern rim of the Lerek caldera, Iliwerung forms a prominent south-facing peninsula on Lembata (formerly Lomblen) Island. Craters and lava domes have formed along N-S and NW-SE lines on the complex volcano; during historical time vents from the summit to the submarine SE flank have been active. The summit lava dome was formed during an eruption in 1870. In 1948 the Iligripe lava dome grew on the E flank at 120 m elevation. 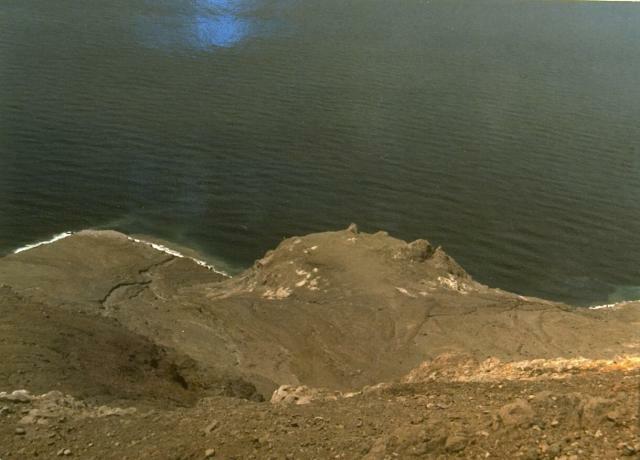 Beginning in 1973-74, when three ephemeral islands were formed, submarine eruptions began on the lower SE flank at a vent named Hobal; several other eruptions took place from this vent before the end of the century. There is no Deformation History data available for Iliwerung. There is no Emissions History data available for Iliwerung. A landslide in 1979, not associated with an eruption, originated from the northern end of the Iliwerung volcanic massif. The resulting debris avalanche swept into the Indian Ocean at a high velocity and produced a tsunami that scoured the shoreline of Lembata (Lomblen) Island, killing more than 500 people. 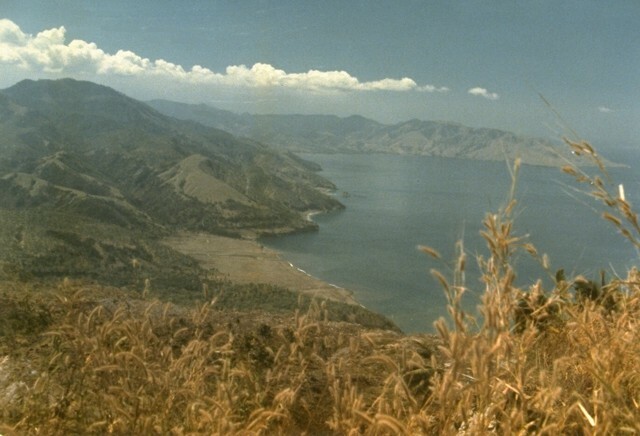 The extent of the runup of the tsunami can be seen forming the flat barren area in the center of the photo, which was taken from the SW on 27 July 1979, shortly after the tsunami. Photo by Ruska Hadian, 1979 (Volcanological Survey of Indonesia). The Watuwawer fumarole field at Iliwerung volcano provides a permanent heat source for cooking utilized by people living on the flanks of the volcano. A lava dome, formed during the first historical eruption of Iliwerung volcano in 1870, occupies the summit crater of the volcano, seen here in 1979 from the western rim of Ado Wajung crater. Iliwerung forms one of the south-facing peninsulas on Lembata (Lomblen) Island, and has a series of lava domes and craters along N-S and NW-SE lines. Many of these vents, including submarine vents offshore, have erupted in historical time. 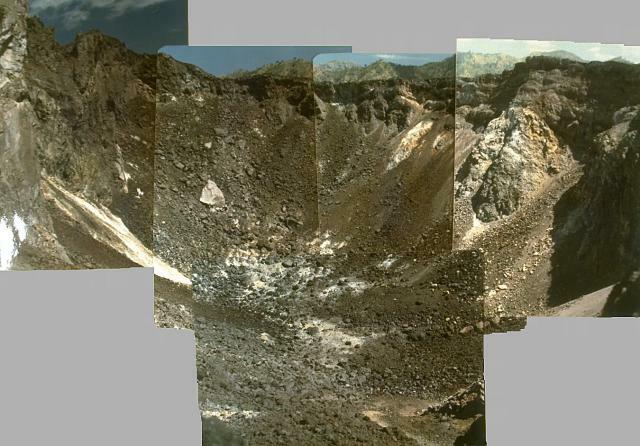 A composite photo taken in 1979 shows the crater at summit of Iliwerung lava dome. The summit lava dome was formed during an eruption in 1870, the first historical eruption of Iliwerung volcano. Iligripe lava dome on the SE flank of Iliwerung volcano on Lembata (formerly Lomblen) Island formed during an eruption from April 7 to November 26, 1948. Growth of the 190-m-high lava dome, seen here at the center of this 1979 photo, was accompanied by explosive eruptions and pyroclastic flows. A lava dome, formed during the first historical eruption of Iliwerung volcano in 1870, occupies the summit crater of the volcano, seen here in 1979 from the rim of Ado Wajung crater. 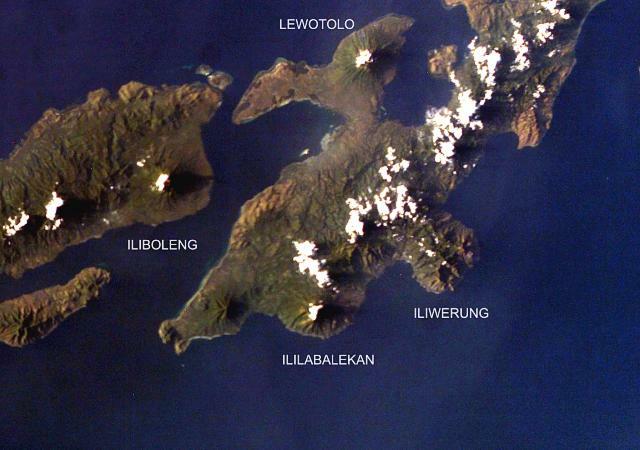 Iliwerung forms one of the south-facing peninsulas on Lembata (formerly Lomblen) Island, and has a series of lava domes and craters along N-S and NW-SE lines. Many of these vents, including submarine vents offshore, have erupted in historical time. There are no samples for Iliwerung in the Smithsonian's NMNH Department of Mineral Sciences Rock and Ore collection. IRIS seismic stations/networks Incorporated Research Institutions for Seismology (IRIS) Data Services map showing the location of seismic stations from all available networks (permanent or temporary) within a radius of 0.18° (about 20 km at mid-latitudes) from the given location of Iliwerung. Users can customize a variety of filters and options in the left panel. Note that if there are no stations are known the map will default to show the entire world with a "No data matched request" error notice. Large Eruptions of Iliwerung Information about large Quaternary eruptions (VEI >= 4) is cataloged in the Large Magnitude Explosive Volcanic Eruptions (LaMEVE) database of the Volcano Global Risk Identification and Analysis Project (VOGRIPA).